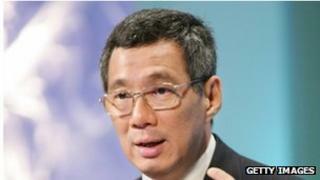 Singapore's highly-paid ministers face massive pay cuts, following a recommendation by a government-appointed committee. The prime minister's salary is to be slashed by 36% and the president's by 51%. The salary committee was set up after parliamentary elections last year that saw the ruling party secure its lowest overall vote since 1965. The government intends to accept the recommendations, local media said. Even with the 36% pay cut, Prime Minister Lee Hsien Loong will still be one of the highest-paid political leaders in the world with S$2.2m ($1.7m, £1.08m) a year. In comparison, US President Barack Obama earns about $400,000. President Tony Tan, with a cut of 51%, will still earn S$1.5 million. Members of parliament and political appointees are also included in the salary cuts. Entry-level ministers will get a pay cut of 37%, with an annual salary starting from S$1,100,000. The recommendations are based on "a salary formula that features fixed and variable pay components which are linked to individual performance and national outcomes", according to the report released by the committee. The recommendations will be debated in parliament this month.